Your goal as a business owner is to attract an audience that wants what you have to offer. Your content is a surefire way to introduce your audience to your service and how it will fulfill their needs. We write about web copy and blogging a lot. But what if we told you there was another type of copy that can enhance your online offerings and increase your reach to your ideal audience? That copy? It’s called a lead magnet. The goal of the copy is to answer a question or solve a problem in exchange for a lead’s contact information. Often, lead magnets are used to gather email addresses for more targeted communication opportunities in the future. A lead magnet isn’t a promotional piece of content that talks about your services or long-form sales copy. It isn’t written for your brand. Instead, a lead magnet is created for your audience to fill a void they have. You might be thinking: “why do I want to give away what I know…for free”? 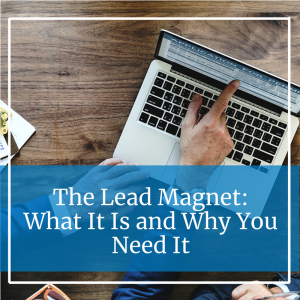 Believe it or not, a lead magnet won’t hurt your business. A successful content freebie will make your audience want more, driving them back to your website often and, if done right, seeking out your services. Beyond this, lead magnets are perfect for business in three key areas: creating brand awareness, increasing engagement and building trust. Every time you share your content, you create awareness of your brand. The words you use, the way you format your copy, and your color scheme take center stage inside of your lead magnet. Each time someone reads, share or uses your lead magnet, your brand is on display, allowing the reader to become more familiar with you. Every piece of content you share gives your audience more opportunities to engage with you. To grab that lead magnet, they have to share their email address with you. Then, proper calls to action within your magnet will give them the opportunity to engage even further. Whether it’s following your blog or sharing your magnet on social media, engagement boosts your message. Before someone buys from you, they want to know that you’re the real deal. How do you prove you’re the real deal before you’ve ever spoken with someone? Use a lead magnet to showcase what you know and how it can benefit your audience. This builds trust in your brand and greater connections with your ideal audience. Lead magnets are great for generating even more content for your content pipeline. For example, an eBook has multiple blog posts already inside of it, not to mention a slew of social media quotes and more ready to go. Recycling your content to create new valuable content is not only okay, it is smart and productive. Your lead magnets and website content should work together to create a strategy that attracts your ideal audience. Are you attracting the wrong audience, or maybe, none at all? We can fix that. Give us a call today at 612-643-1824 or contact us online!